Spring is here and the weather is getting warmer. With the arrival of spring comes blue skies, blooming flowers, and spring cleaning! The nice weather that comes with the season makes for the perfect time to take preventative measures to help maintain your home and property throughout the year. Check your smoke alarms. Test the batteries, if the detector makes a chirping sound, replace the batteries immediately. Replace any smoke detectors that are over 10 years old. Check all electrical cords on appliances, televisions, computers, stereos, and heating/cooling devices. If any wires are cracked or frayed- they must be repaired or replaced. Make sure cords are not pinched in doors, windows, or under heavy furniture or rugs. Clean any dust, grime, or grease from toasters, microwaves, and stoves. Clean the area under and behind the washer and dryer and make sure there are no flammable materials nearby like cardboard or cleaning supplies. Clean lint from dryer vent by vacuuming the lint trap. Before you turn the grill on- check the propane tank, hose, and all connection points to ensure there are no leaks. You can check for leaks by using a 50/50 solution of water and soap. If bubbles appear- there is a leak. If you are using a charcoal grill, only use charcoal starting fluid. Adding these small measures to your spring cleaning routine can help ensure a safe season for you and your loved ones. If your family has experienced a fire and needs help restoring your home, SERVPRO® of Piscataway can help! Give us call to learn about our fire restoration services and what we can do for you. Dealing with water damage is a homeowners nightmare. Whether it came from a broken pipe, overflowing toilet, sump pump failure, or flooding from a storm- water damage can cause more problems than you may think. In many cases, the damage will go much deeper than the water line. The drywall, wood, and even concrete can act as as sponge which causes the water damage to extend deeper into the structure. An even bigger concern is what can come after the water damage, if not properly dealt with-mold. Mold is toxic. It is created when there is moisture hidden in walls, crawlspaces and below floorboards. Obvious signs of water damage include- water stains on the floor around the bathtub, toilet, or sink, and on ceilings and walls. Cracks in the drywall, or areas that appear swollen or soft, as well as peeling paint. For tile and wood, look for cracked, buckling, or warped flooring. For carpets- be aware of damp spots, gradual rises, soft spots, and a musty smell. Check your water heater for rust on the tank, or damp spots on the floor. Corrosion around pipe connections could signal water seeping from the pipes. Check for visual signs of mold. We at SERVPRO of Piscataway are here to make the cleanup process easier for you and your family. Water damage in your home sometimes goes unnoticed. Plumbing leaks, flooding, roof damage and storms are just a handful of ways that water can find it's way into your home. Making its way into ceilings, walls, furniture, cabinets; water damage can be both a noticeable and unknown dilemma in your home. Water damage can begin with subtle changes that might not be noticed right way. such as a unfamiliar odor. Attending to the situation quickly can no doubt reduce the severity of the damage to your home and may also reduce restoration cost. 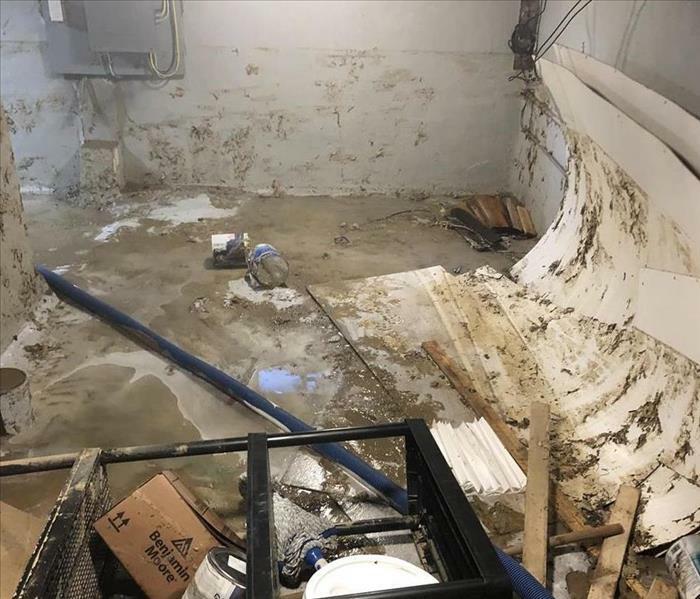 There are various reasons your basement could flood, such as a blocked or failed sewer pipe, storm sewer back up, water supply-line break or hot-water tank failure and many more. An inspection once a month should be done. Inspect areas of basement that water shouldn't be. SERVPRO of Piscataway is available 24/7 for all your water restoration damage. Our technicians are trained and equipped to handle the job. 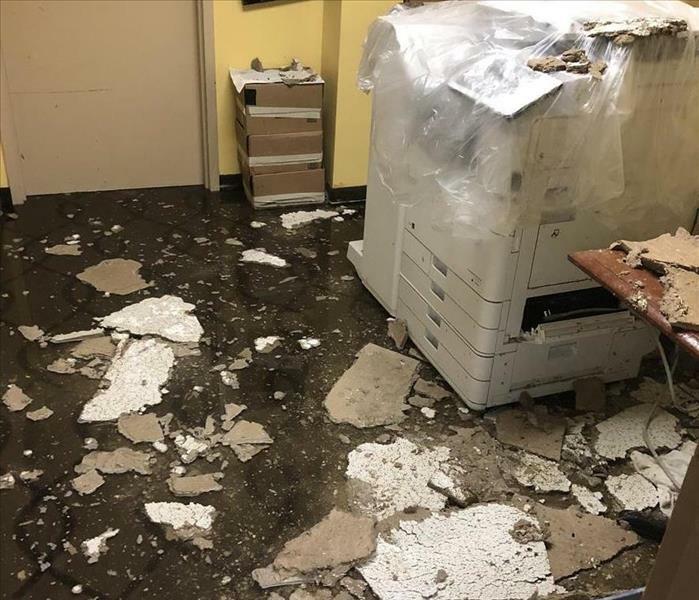 Water damage in office space at Somerset NJ. SERVPRO of Piscataway is a reliable conductor in the restoration industry. Managing a clean office space not only helps establish an upbeat first impression with clients, but can also develop employee morale. A spotless office is a bright office. Commercial Restoration and cleaning in any small office, apartment buildings, restaurants, hotel/ motels, manufacturing & industrial, government / military, SERVPRO of Piscataway does it all. We handle your carpet cleaning, duct cleaning and even any water restoration damages. SERVPRO of Piscataway has trained and knowledgeable technicians to get the job done quickly and efficiently. Clients are pleased with how fast restoration was completed. SERVPRO of Piscataway is here for all your commercial restoration and cleaning 24/7, 365 days a year. Tropical storm damage in Jersey Shore. We can’t predict when a storm disaster will strike, SERVPRO has disaster recovery teams on standby positioned all over the country to deal with hurricane damage on a large scale. Hurricanes are categorized by their extremely strong winds that can blow from 75 to 200 miles per hour. Hurricane season begins around June 7th and can last as long as 4 months. So it is recommended that those in areas of hurricane activity are prepared. What to do in the event of a hurricane? Prepare a hurricane kit, have enough non perishable food and water to last for several days. Have a generator, by have this equipment you may be able to save the food in your fridge and freezer. Prepare a medical kit, include a first aid kit and several days of prescription drugs needed. Make sure you have all your necessities, these can vary per person. Some necessities are flashlights, extra batteries and hygiene products. Heavy rain fall that comes with a hurricane may cause flooding weather minor or major flooding. This flooding may cause water damage to your property. To lessen the effects of flood damage it is recommended to use sand bags to direct the flow of water away from your home. If you sustain any damages from such storm or disaster we are here to help 24/7. Damage caused by main sprinkler break. Water in your business? Let SERVPRO of Piscataway assist as we know how serious water damage can be to your property. SERVPRO of Piscataway is quick to respond to all your commercial water damages. 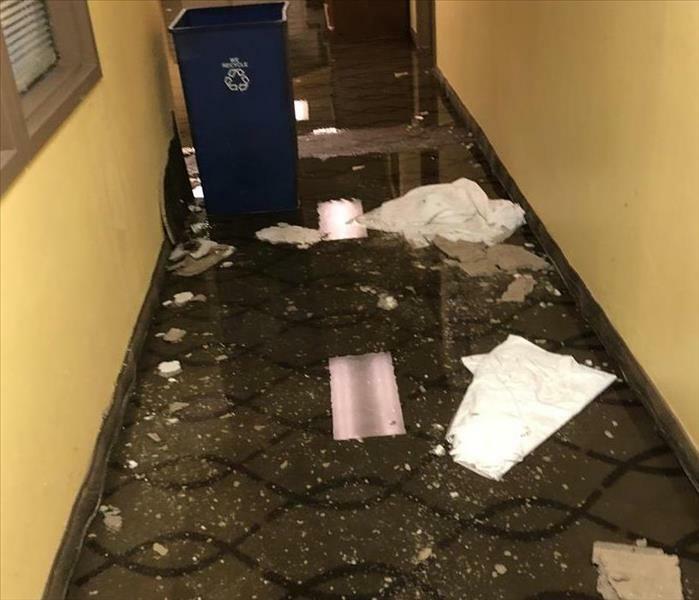 A hotel in Somerset NJ was under 3"- 4" of water when we were called.. SERVPRO of Piscataway responded quickly to their offices which sustained significant damage due to the large volume of water present. We preformed the clean up and dry out quickly. The client was very pleased at how fast the replacement of materials began. What can happen if excess moisture is not addressed quickly? Water damage within 1-24 hours can cause furniture to swell and crack. Drywall begins to swell, metal surfaces can tarnish and documents can be damaged. Odors will start to appear, which can be difficult to get rid of if not treated early. Water damages that are a week old may cause mold to grow which can be harmful to one's health especially those who have an allergy to mold. SERVPRO of Piscataway is here to help with any commercial water damage 24/7 365 days a year. Call us at (732) 752-4445. Its isn't a great way to spend your weekend, but cleaning out built up debris is important. There are many problems that are caused by clogged gutters. Not everyone would stop to think about the problems that can come from clogged gutters. From your roofing to your foundation damage can be done if there isn't a way for water to properly flow away from your property. Damaged to your roof can be caused, when your gutters are left clogged with leave or other debris. It can also cause an overflow of water, or even a flood. this can cause your roof to deteriorate more quickly. Clogged gutters can even be the nesting homes for all sorts of insects and animals. Specifically, when gutters are clogged it can cause an overflow of water. The overflow of water can eventually flow along the foundation of your property, which can freeze and crack your foundation. SERVPRO of Piscataway highly recommends that gutters be cleaned right after the leaves have fallen in autumn. Our team is well informed and fully trained in taking care of any problems caused by improperly draining water. SERVPRO of Piscataway is at your call 24/7 for all your gutter and downspout problems. We count on advanced warning for some types of severe weather, but there are also those occasions where we get caught off-guard by some severe weather events. To ensure your family is prepared for different types of severe weather situations, there are steps you can take and safety tips to follow. One of the best ways to be prepared for these weather situations is to create a family emergency plan. If your family does have an emergency plan in place, so that everyone knows what to do, it is important to practice, discuss and review it at the start of various weather seasons. Today’s technologies make it easy to receive emergency alerts and warnings on your smartphone that is equipped with a weather app or Google. This can provide you with valuable time in severe weather situations, in addition to the warnings and alerts that are broadcast over radio and TV. When living in an area where tornadoes are common, you should shelter in the lowest part of your home, preferably a basement if you have one. If there is no basement, use an interior room on the lowest level that is away from corners, windows, doors and outside walls. Tornadoes are not the only situations that require some form of storm shelter, and you can learn about more of the situations that call for them by visiting ready.gov. A mapped out evacuation route is good, and having several routes is best as there is that possibility a route could become impassable. Hurricanes, floods and fires can cause you to evacuate quickly and knowing the routes ahead of time is a plus. Find routes with places that will allow you to stay with your pets along the way. Cell phones are an excellent form of communication for families in an emergency, however, in some circumstances that may not be entirely possible. Cell phone towers can be damaged, phones may be lost or left behind, and phone batteries will die if there is no power to recharge them. Your family should have an emergency communication plan in place and a safe meeting place after evacuation so that you can all meet there if separated. If a storm does cause damage to your home or business, don’t hesitate to call your friends at SERVPRO® of Piscataway to get the cleanup and restoration process started. SERVPRO of Piscataway understands your situation. Whether it be Fire, Water Or Mold related we are always here to help. Our certified trained technicians will make you feel at ease when you speak to them regarding your concerns. We at SERVPRO of Piscataway work with all types of claims and will work with your insurance company to give you peace of mind. Restoring property is SERVPRO of Piscataway first priority. You will appreciate the immediate response and you will know everything is being done to limit the damage. Restoring property is less expensive than replacing property. Claims Professionals know the rule is, "Restore whenever possible, replace only when necessary." SERVPROof Piscataway makes sure pretesting is completed on every loss to determine restorability. SERVPRO of Piscataway professionals can provide an itemized loss inventory. You will receive an Excel formatted report and pictures of important items. Effective training is the best way to receive the service every customer deserves. SERVPRO of Piscataway technicians are fully trained to IICRC standards in Fire and Water Cleanup and Restoration. .
At SERVPRO of Piscataway our technicians job is to reassure the customer, perform quality service and to report to you quickly with any findings. 24-hour emergency response, damage mitigation, loss assessment, and an electronic files are available to you within hours. Hard-earned results have made SERVPRO of Piscataway is a trusted company for water, Fire and mold cleanups and restoration needs. Would your business be prepared to face all that Mother Nature can throw at it through floods, hurricanes, tornadoes, wildfires and earthquakes? The most important key to surviving these natural disasters is to be prepared for these situations. Being prepared for those scenarios involves building a natural disaster plan for your business. This blog will cover some aspects to consider when designing that plan. There are many different factors you will need to consider when building a disaster plan for your business. This includes your employees as well as your assets such as equipment and merchandise. There have been many checklists made available to us by sources like the Red Cross, FEMA and Ready.gov that will assist you identifying areas that need to be included in your natural disaster preparedness plan. These sources will also show you just how unprepared you are. In case a disaster were to strike without warning, a plan needs to be in place that lists procedures and safety measures for employees and visitors to follow and is extremely important. Make sure evacuation routes and exits from your facility are all clearly marked, mark a shelter space within the building for people to use as a shelter, consider installing emergency lighting, and have designated volunteer “safety wardens” who are properly trained and ready to guide and assist with all emergency efforts. When making a selection for a shelter space, it is always recommended to use a basement or storm cellar in the event of tornadoes or other high-wind situations. This is not always an option, so if you have no basement space, identify a small interior room on the lowest level of the building or a closet or interior hallway also located on the lowest level of the building. If you have a business that is located in a brick and mortar building, you’ll still want to make provisions for protecting the assets that are inside. From equipment to merchandise, you stand to lose thousands of dollars when a natural disaster strikes. Be sure to have a comprehensive and up-to-date inventory of these items, and yes, having photographs prior to a disaster whenever possible is always helpful if insurance claims will have to be made. If your assets are based on a computer server, take the steps necessary to ensure that the backup system is working and the storage system cannot be damaged. If you own your building, you can talk with a contractor to uncover areas that could be improved on in regard to structural integrity. The contractor can walk you through possible safety upgrades and advise on any areas that may not make the grade in certain weather situation. When a natural disaster does occur, it is possible that your business will have to be closed due to damage, and every day you remain closed is another day of lost profits. It is wise to have a “rainy day” fund saved to help with additional costs that are not covered by your insurance. Take some time and talk with a contractor to locate areas that could be improved on with regard to structural integrity. This contractor can also walk you through possible safety upgrades and identify any areas that may not meet code certain weather situation. Compile a list of contractors that would be available for construction concerns, and find a cleanup and restoration service that will be available to quickly respond to your emergency situation. With SERVPRO® of Piscataway, you can count on us to get to the disaster faster and make it "Like it never even happened." Our expertise and trained professionals are fully prepared to help with water damage, storm damage, fire damage and mold remediation quickly and effectively. Knowing what to do when disaster strikes your business is of the utmost importance. When it comes to the cleanup and restoration aspects, depend on SERVPRO® of Piscataway to be there for you.